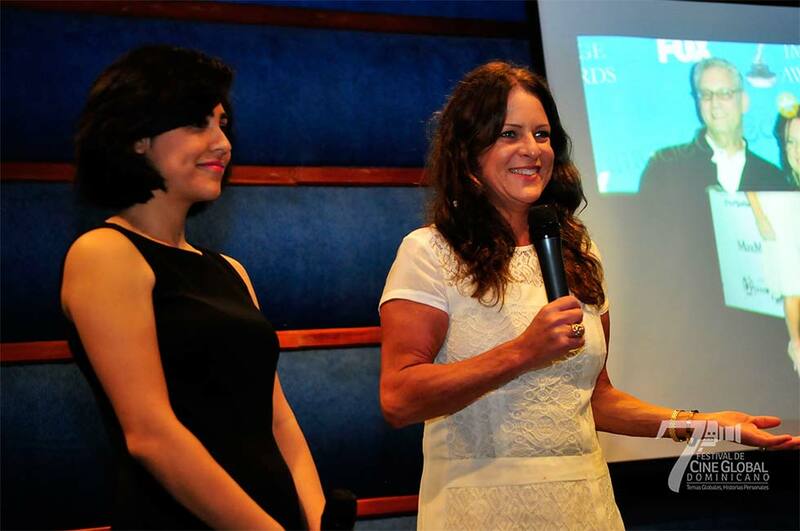 (Santo Domingo, October 28th 2013) – The renowned American producer Cathy Schulman, winner of an Oscar for her movie Crash, participated in a discussion this Monday in the auditorium of the Fundación Global Democracia y Desarrollo (FUNGLODE), where the main topic was the work still to be done for women in cinema. She explained how the organization she leads, “Women in Film,” is invested in promoting gender equality in the film industry through a series of academic programs, scholarships and support forums it runs for women in the film industry. The American producer, who came to the country with other directors from the non-profit organization “Women in Film,” reported the findings of their recent survey of about 1,000 female filmmakers. The survey found that the main reason they end up not completing a project is a lack of financing. As a result, forums with business people will be held in New York and Los Angeles to orient these up-and-coming artists. She said it was worrying that only 18% of high-level positions in international filmmaking are held by women. “Producers, directors, directors of photography, script writers and executive producers are mainly men and we have to see why this is happening,” she added. Asked about her perception of when a movie is good, Schulman said that at first, the film has to be profitable (her film Crash was made with $7 million and earned about $60 million). It must also be a film that moves the audience to comment, must somehow influence society and finally, it must have the support of the critics. The event, organized by the Women’s Association of Dominican Republic Cinema (AMUCINE) , the General Directorate of Cinema (DGCINE) and the Dominican Republic Global Film Festival (FCGD), also hosted film students, journalists, the media and a significant number of people connected to the local and international film industry.